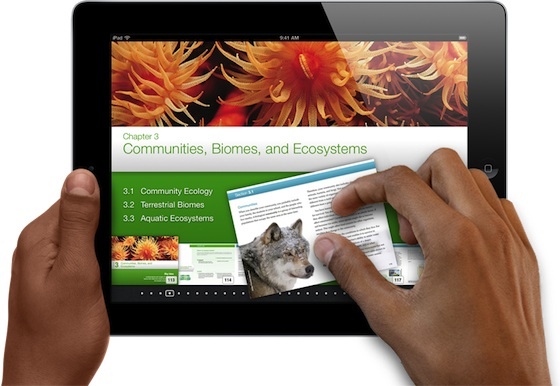 We are thrilled by Apples’ recent announcement this week about apps that may change the textbook paradigm. We have long been frustrated that while less expensive digital versions of popular books proliferate, the availability of ebooks has only recently begun to slowly increase. Apple’s announcement dangles the near future promise of $14.99 multimedia rich K-12 textbooks that never grow out of date. Easy to overlook in the news about Apple’s agreement with publishers is the new “iBooks Author” app. This tool immediately offers teachers the prospect of self-publishing their own materials in multimedia rich book form. For students with iPads these “texts” will sit right along their digital bookshelves next to their other books and will contain many of the same features. This entry was posted in Mercy 2.0 and tagged i Books 2, iBooks Author, iPad. Bookmark the permalink.